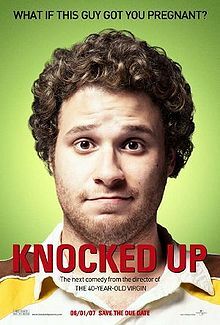 In Judd Apatow’s second feature film as a director, unemployed stoner Ben (Seth Rogan) has a one night stand with career-girl Alison (Katherine Heigl) and both have to cope with the resulting pregnancy. This entry was posted in Comedy, drama and tagged Jason Segal, Jonah Hill, Judd Apatow, Katherine Heigl, Kristen Wiig, Leslie Mann, Paul Rudd, Seth Rogan, The 40 Year Old Virgin. Bookmark the permalink.